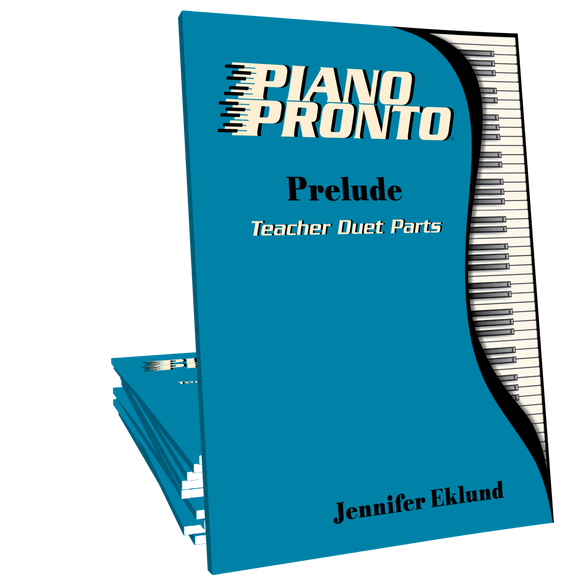 Teacher accompaniment parts for all 32 songs from the Piano Pronto Prelude method book by Jennifer Eklund. Fresh, contemporary duet parts for all 32 songs in the Piano Pronto Prelude method book! These duets will delight students of all ages and help to reinforce their rhythmic skills. I cannot believe how excited my students were when we put these duets together. They are fresh and contemporary and make these familiar tunes come alive. Happy students, happy teacher. Duet playing with students is so good for building their ear and developing a dependable sense of rhythm. These duets are contemporary and fresh. I love using these! These are a great teaching tool. They strike a balance between readability for the teacher and excitement for the student. I use them often in lessons and featured a few duets in a recent recital! I love the duets in this book. No boring teacher parts here! The harmonies are so interesting and fun. They really enhance the student's part. Great addition to my students' lesson! LOVE this!!!! So thankful you put this together! I love how each piece complements the prelude pieces and I think it will really be exciting for the beginner students to feel they can be apart of beautiful music even starting out! These are great! I will definitely be using these. These teacher duets for the Prelude book are AWESOME! This is exactly what I was looking for – to be able to play along with my students in this bood and make their playing sound SO good! They are all thrilled to hear the sound we make together. ALSO – the arrangements are written in such a unique and refreshing way -I’m truly impressed! Fun and motivating music for students and their teacher ! We are having a blast with these duets in my studio! Lots of smiles! These duets encourage students to really listen to their playing. Love it so much! My students and I really enjoy it. My students absolutely love these duets! Young and old alike…every student enjoys them! With more advanced students, I give them the teacher duet to improve their sight reading, and I take the easy part…it’s fun! I am using the teacher duets in two ways , as a teacher I accompany my students as they play the easier versions of the pieces. With my more advanced students I have them play the teacher duet parts and I play the easier versions. Its great for sight reading and also so valuable when teaching students all about ledger lines in music. Nothing but big smiles from my students when we can play music together during a lesson. These duets are fantastic! They are actually fun for me to play with my students because it’s more than “oompa” or blocked chords. They’re very lyrical & fresh. Students always impressed by how full the music sounds when I add my part. Duets are a powerful teaching tool. GREAT SOUNDING duets like these are a musical motivator! 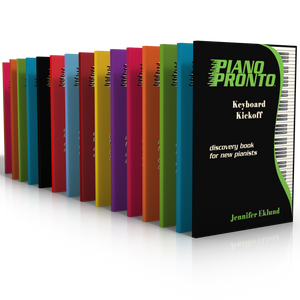 These are a must-have for any Piano Pronto teacher. I almost didn’t buy the teacher duets because I can improvise better ones that included with most methods. On a few recommendations I picked this up…and then quickly bought the other teacher duet book available because these were SO MUCH FUN for me AND the students!